Lest the last few posts give the impression that I only purchase books at conventions, here are some others which arrived in the past week. 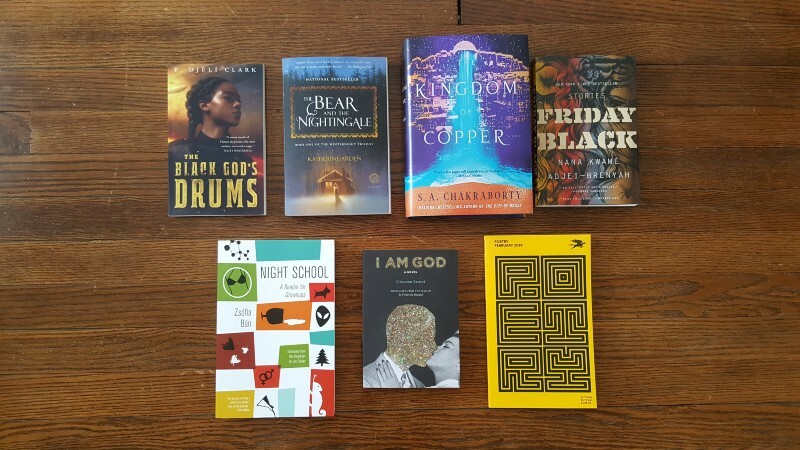 On the left is The Black God’s Drums by P. Djeli Clark, which has been on my radar for a couple of months now. Next to it is Katherine Arden‘s The Bear and the Nightingale, because Russian folklore. Also about a year ago I wrote most of a Baba Yaga story for an anthology call, and in the research for that story this book came up repeatedly. The third is The Kingdom of Copper by S.A. Chakraborty, the sequel to her excellent The City of Brass which I read several months ago. Next to it is Friday Black, a collection of short stories by Nana Kwame Adjei-Brenyah which came to my attention when LitHub posted the story “Zimmer Land“. The bottom row includes reading material from various subscription. First is Night School by Zsófia Bán, then I Am God by Giacomo Sartori, and finally the latest issue of Poetry. In reading, I finished Fix by Ferret Steinmetz (which Mr. Steinmetz signed at ConFusion 2019!) and am now bouncing between three of my ConFusion acquisitions: Reckoning #1, Death March by Phil Tucker, and The Blood-Tainted Winter by T L Greylock. For this year I am keeping a list of the books I read, and I plan to write reviews (GoodReads, Amazon, etc.) both to boost the signal of those authors and to give me practice at writing reviews. That’s all for now. The books continue to accumulate.